Top Contributors - Laura Ritchie, Lennert De Henau, Michelle Lee, Evan Thomas and Claire Knott - Your name will be added here if you are a lead editor on this page. The discoid (discoid: shaped liked or resembling a disk) meniscus, also called the popping knee syndrome, is a variation on the normal meniscus. The pathology mostly concerns the lateral meniscus and is presented in the young population and during adolescence. Some people with discoid meniscus never experience any problems, but in most cases they will have knee problems related to the discoid meniscus. Such as vague pain in the knee and in some cases there will be an annoying “click” on the lateral side of the knee. A discoid meniscus is more prone to injury than a normally shaped meniscus. The abnormal shape of the discoid meniscus makes it more likely to get stuck in the knee or tear. The risk for injury is even bigger when the ligament attachment to the tibia is also missing. 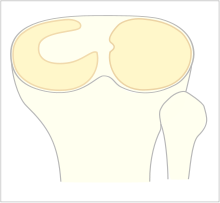 The meniscus is a half circular disk of cartilage and is located between the tibia and the femur. There is an inner (medial) and an outer (lateral) meniscus. The meniscus has a shocking absorbing function and it also contributes to the stability of the knee (secondary stabiliser, where the ligaments are the primary stabilizer). As mentioned above the discoid meniscus concerns mostly the lateral meniscus. A discoid lateral meniscus results from developmental anomaly before birth. No sudden change occurs in meniscal development after birth. Because of the high rate of asymptomatic patient it’s difficult to estimate the actual incidence of discoid meniscus. The incidence for the lateral discoid meniscus ranges from 0.4 to 17% and for the medial 0.06% to 0.3%. The Asian population has a slightly higher rate of occurrence. There are three types of discoid menisci (A) incomplete: the lateral meniscus is a bit thicker and wider than a normal meniscus (B) complete: the tibia is completely covered by the meniscus (C) Hypermobile Wrisberg: the meniscus is not abnormal in shape but there is no posterior attachment to the tibia. This results in a hypermobile meniscus. Hypermobile Wrisberg is a very rare injury, the prevalence is as low as 0.2% . The chief presentations, in absence of a traumatic cause, are a visible or audible palpable snap on terminal extension (10-20°) along with pain swelling and locking. Also there can be an annoying click during movement. Meniscal tear is associated with the discoid meniscus. MRI gives a clear picture of soft tissue so it can be used to visualise the meniscus. 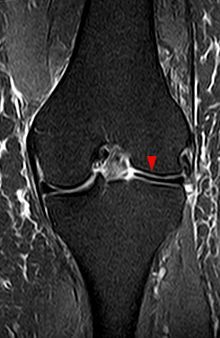 The most accurate criteria, for the diagnosis of discoid meniscus, on MRI are a ratio of the minimal meniscal width to maximal tibial width of more than 20% and a ratio of the sum of the width of both lateral horns to the meniscal diameter of more than 75%. So the MRI can show the abnormal shape of the discoid meniscus, as well as tears within the meniscus. The rare Wrisberg type can’t be tested with an MRI scan because the problem only occurs when the patient is moving. During the physical examination, a pressure-sensitive swelling can be found at the level of the lateral joint space. To test for discoid meniscus it’s necessary to twist the patients knee in flexion and extension. A popping or clunking sensation or a staggered sense may occur during the flexion and extension movement of the knee, it is usually related to the less common Wrisberg ligament type. Possibly there’s a limitation of motion during the knee flexion and extension. Also there can be an anterolateral bulge at full flexion. A positive McMurray test can be found, but it’s not typical especially for young children. The accuracy of clinical examination ranges from 29%-93% when compared with knee arthroscopy findings. This can be explained by the variation in symptoms, their descriptions as being intermittent and vague and an insidious evolution. Traditionally, the treatment for stable or unstable discoid meniscus is an open total meniscectomy. But recent research has proved that a partial meniscectomy of normal shaped menisci, was shown to increase the contact stresses in proportion to the amount of removed meniscus. Total meniscectomy of a non-discoid meniscus often leads to osteoarthritis. Keeping in mind the negative effect of a meniscectomy on the normal functionality of the knee, the goal in treatment planning should be preservation of meniscal tissue. Discoid meniscus with no symptoms or physical signs should not be treated surgically. Still it’s important to do a periodic follow-up for early detection of any deterioration and appropriate treatment planning. Nowadays, arthroscopic partial meniscectomy is the treatment of choice for symptomatic stable, complete, or incomplete discoid meniscus. As mentioned above removal of the entire meniscus speeds degenerative change within the joint, so the current standard therapy is to remove the abnormal central portion and preserve a rim of meniscus to maintain the biomechanical benefits. It is still early days in evaluating the effectiveness of supervised physiotherapy after arthroscopic partial meniscectomy. More studies are needed to prove the effectiveness. If a meniscal repair has been performed, extreme flexion and rotation should be limited until the wound in the meniscus has had time to heal (8 to 12 weeks). Strengthening around the knee is crucial but it may also be necessary to strengthen the adjacent joints if weight-bearing was restricted pre- or post-operatively. While strong muscles around the joint are critical, flexibility exercises of the same muscle groups must be considered and should be included throughout the period of strengthening. Progress weight-bearing: weight-bearing and joint stress are necessary to enhance the functionality of the meniscal repair and should be progressed as indicated by the surgeon. ↑ 16.0 16.1 16.2 16.3 16.4 Teller P, Konig H, Weber U, Hertel P. MRI atlas of orthopedics and traumatology of the knee. London:Springer, 2003. ↑ 17.0 17.1 Thomson LC, Handoll HH, Cunningham A, Shaw PC. Physiotherapist-led programmes and interventions for rehabilitation of anterior cruciate ligament, medial collateral ligament and meniscal injuries of the knee in adults. Cochrane Database Syst Rev. 2002;(2):CD001354. ↑ Atkinson HDE, Laver JM, Sharp E. Physiotherapy and rehabilitation following soft tissue surgery of the knee. Orthop Trauma. 2010;24(2):129-138.